Definition - What does Vasisthasana mean? Vasisthasana is a challenging asana that strengthens the abdomen, legs and arms. The name comes from the Sanskrit, vasistha, meaning “wealthy,” and asana, meaning “pose.” Vasishtha is also the name of several different yoga sages, including an author of Vedic hymns and one of the seven rishis. 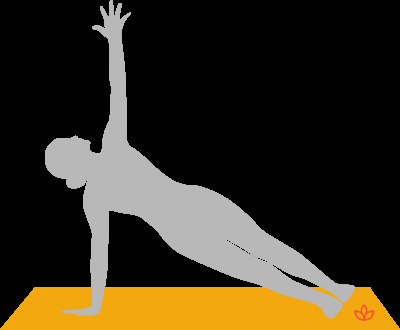 Vasisthasana is typically entered from straight-arm plank pose. Then the yogi lifts one arm toward the sky and rotates the body until it faces straight ahead. In this pose, the body should resemble a cross tilted on its side. Vasisthasana is also known as side plank pose in English. In Hinduism, Vasistha was a saint who possessed a divine cow. The cow's offspring could grant whatever its owners wished, which made Vasistha wealthy. This is why the Sanskrit word for "wealthy" is vasistha. This is an apt name for vasisthasana as it can help the yogi feel abundant in power and confidence in their yoga practice as it requires strong mental focus and balance. Vasisthasana assists in opening the anahata (heart) chakra as it opens the chest. This helps the yogi to feel more receptive to the serenity, love, balance and peace that is all linked to the anahata chakra. Vasishthasana is also believed to open the manipura (solar plexus or navel) chakra, which is associated with self-esteem, transformative power, decisiveness and confidence. In an advanced version of the pose (sometimes called eka pada vasisthasana), the upper leg is raised to the sky and the upraised hand holds the big toe. This version was taught by the late B.K.S. Iyengar, founder of Iyengar yoga. In both variations of the asana, the drishti (gaze) is either straight ahead (easier for alignment) or toward the upraised arm.